Extreme process temperatures cause process instrumentation, especially a pressure gauge or pressure transmitter, to age prematurely. 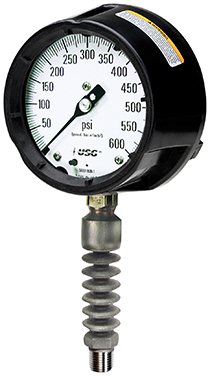 The Sta-Kool protects pressure equipment by reducing the process temperature by the time the media gets to the inside of the pressure gauge, transmitters or switch. The cooling element can also be used in conjunction with a diaphragm seal, to provide maximum protection of the instrumentation. Test have shown the Sta-Kool can reduce the process or media temperature from 400°F (204°C) to 100°F (38°C) by the time the media gets inside the pressure gauge bourdon tube. The Sta-Kool is available in 316L SST with a ½” NPT male and female connection. Request more information to see how we can help you with a solution that fits your exact needs.